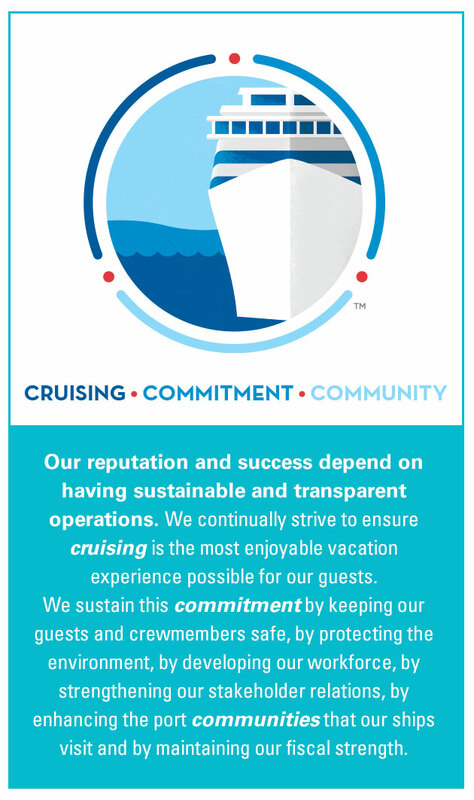 Carnival Corporation & plc has been recognized in a number of global and local forums for our sustainability-related performance, particularly in relation to environmental, social, governance and guest-satisfaction issues. Since 2006, Carnival Corporation & plc has been a member of the FTSE4Good Index, the socially responsible investment index calculated by global index provider FTSE Group. The FTSE4Good Index measures the performance of companies that meet globally recognized corporate responsibility standards and facilitates investment in those companies. From 2008 to 2012, the Carbon Disclosure Project (CDP) has recognized Carnival for our transparency, particularly in relation to our GHG emissions and climate change disclosures, by inclusion in CDP’s Carbon Disclosure Leadership Index. Carnival Corporation & plc has been listed on the Maplecroft Climate Innovation (CII) Leaders Index of the “100 Top Performing Companies” that successfully innovate and manage climate-related opportunities and risks. Carnival Corporation & plc has been recognized in their Top 500 Green Companies both U.S. and Global companies since ---. In 2014, Carnival ranked number 280 in the Newsweek annual rankings. These rankings, based on research conducted by KLD, Trucost and CorporateRegister.com, take into account environmental impact, green policies and reputation. Corporate Responsibility Magazine listed Carnival Corporation & plc as number four in the Media, Entertainment and Hospitality industry Category and 58 on its 14th Annual “100 Best Corporate Citizen List” for 2013. The 100 Best Corporate Citizens database is based on publicly available data sources and computed by IW Financial, a Portland, Maine-based financial analysis firm serving the environmental/social/governance (ESG) investment community. Carnival Corporation & plc was recognized by GreenBiz Group and Trucost as a Natural Capital Decoupling Leader within the Natural Capital Leaders Index. Just 34 companies were identified as Natural Capital Decoupling Leaders; ‘companies that increased revenue while decreasing natural capital impacts over the most recent five year period. Natural Capital is the term used for impacts such as pollution, and natural resources such as water, that companies depend upon to deliver economic growth. Natural Capital Decoupling Leaders have most successfully decoupled revenue growth from natural capital impacts in their operations and supply chain over the last five years, meaning that the company’s revenue has increased whilst it’s demand on natural capital has decreased. Carnival Corporation & plc was named Clean Tech Award winner for Best Marine Solutions, in 2013. The New Economy is a publication that covers cutting edge technology, energy, business and strategy. Carnival Corporation & plc was recognized as Top Ranked Company in Florida in recognition of excellence in sustainability in May 2012 and was ranked in the top 50 companies in Florida in recognition of excellence in sustainability in 2013 by Southeastern Corporate Sustainability Rankings. Carnival Corporation & plc ranked second in the Leisure category of oekom’s Corporate Responsibility Review. Oekom is a German environmental, social and governance (ESG) investment research agency.